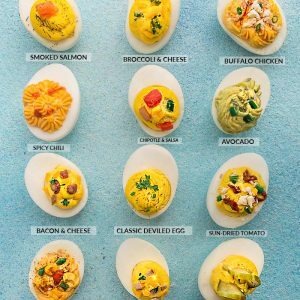 Perfect Deviled Eggs - 12 different ways are the perfect easy make-ahead appetizers for Easter Mother's Day or any weekend or holiday brunch. Best of all, they are low carb, keto and packed with protein. Slice each egg in half lengthwise and scoop out the egg yolks into a large bowl and mash into a crumble with a fork. Add mustard, vinegar, and black pepper. Mash (or beat with a hand mixer) until combined and smooth. Top with a sprinkle of paprika and garnish with chives & parsley (if desired). Add mustard, cream cheese, lemon juice, dill,and black pepper. Mash (or beat with a hand mixer) until combined and smooth. Stir in capers and smoked salmon. Spoon or pipe filling into each egg white. Top with the desired amount of smoked salmon pieces and dill. Add mustard, vinegar, and black pepper. Mash (or beat with a hand mixer) until completely smooth. Stir in broccoli and cheese. Spoon or pipe yolk filling into each egg white. Add buffalo sauce, Greek yogurt, and black pepper. Mash (or beat with a hand mixer) until combined and smooth. Stir in chicken and cheese. Garnish with more hot sauce and crumbled cheese. Add chili sauce, lime juice, smoked paprika, and black pepper. Mash (or beat with a hand mixer) until combined and smooth. Garnish with more hot sauce and a sprinkle of paprika. Add lime juice, and black pepper. Mash (or beat with a hand mixer) until combined and smooth. Stir in chipotles and salsa. Spoon or pipe filling into each egg white. Garnish with more salsa. Mash in avocado. Add mustard, lime juice, tarragon, and black pepper. Mash (or beat with a hand mixer) until combined and smooth. Scoop filling into each egg white. Garnish with tarragon and green peppers, if desired. Add mustard, vinegar, and black pepper. Mash (or beat with a hand mixer) until completely smooth. Stir in ham and cheese. Garnish with more bacon and cheese. Add mustard, vinegar, and black pepper. Mash (or beat with a hand mixer) until completely smooth. Stir in sun-dried tomato, cheese, and parsley. Garnish with more sun-dried tomatoes, cheese, and parsley. Add mustard, hot sauce, lime juice, cumin, and paprika. Mash (or beat with a hand mixer) until completely smooth. Stir in jalapenos, cheese, and red bell pepper. Garnish with chopped jalapenos and paprika. Garnish with more ham and cheese. Add mustard, pickle juice, dill, and black pepper. Mash (or beat with a hand mixer) until completely smooth. Stir in chopped pickles. Garnish with pickle slices and dill.